Martha Crone begins her 21st year as Garden Curator. 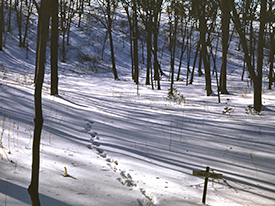 Violet Path in the Woodland Garden, photographed on Feb. 18, 1953 by Martha Crone. Click on image for larger version. “This is the first issue of our Wild Flower Publication - begun in a small, inexpensive way. Let no one be misled by its size - good things frequently come in small packages. Martha Crone, our editor, is a talented writer. One of our Minneapolis newspapers several years ago ran a number of her contributions to “Museum Notes” on its editorial page. She has also been well received as a lecturer on wild flowers, having given over thirty talks, before various clubs and gatherings during the year just past, illustrated by beautiful Kodachrome slides taken by her in the Wild Flower Garden. In addition to telling you about wild flowers and how to raise them, Mrs. Crone will write about birds visiting the garden. The Fringed Gentian, photographed in the Garden on Sept. 24, 1950 by Martha Crone. 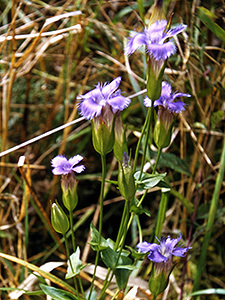 “The Fringed Gentian™ was chosen as the title for this publication because this flower is considered one of the choicest of American wild flowers. It was once proposed as our National flower. The delicate violet-blue corolla, open only in sunshine, is a vase-like tube with four rounded and spreading lobes, finely fringed around the top. They close with a twisting gesture at night or on dull days. It is fast disappearing due to the increased cultivation of wild land. 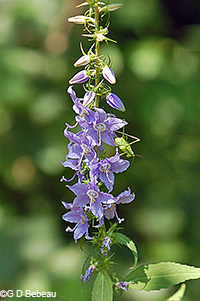 As the population increases the wild flowers decrease. 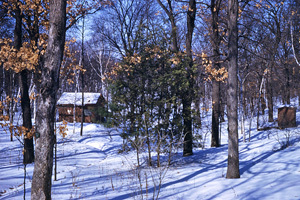 Woodland Garden with Office in the background, photographed on Feb. 18, 1953 by Martha Crone. Click on image for larger version. In that same issue Martha then wrote about the Witch Hazel (Hamamelis virginiana), the Horse Gentian (Triosteum perfoliatum) and a winter brook. A section from Thoreau’s journals about Snow Crystals was quoted. “Thousands of people have enjoyed the facilities of the Wild Flower Garden, either for pleasure or study. Much remains to be done to fully develop the garden. It requires sufficient funds, help and material to do justice to such a unique garden, which is conducted for the preservation of herbaceous plants, shrubs and trees. 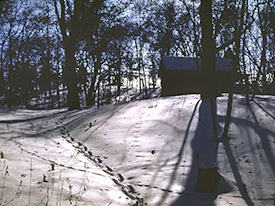 The Garden Office in Winter photographed March 9, 1953 by Martha Crone. Click on image for larger version. Then Martha sent along something else with the mailing: “The enclosed binder was designed for filing of issues of our publication for future reference.”During her 20 year tenure as editor she would continue to send out these binders annually. The first annual meeting of the Friends was held in January at the registered office - that is, the headquarters of Clinton Odell’s firm, the Burma-vita Company, at 2318 Chestnut Avenue West, just east of the Garden. Elected to the Board of Directors were: Russell Bennett, Earle Brown, Dorothy Binder, Martha Crone, Donald C. Dayton, Clinton Odell, Leonard Ramberg, Mrs. Clarence (Edda) Tolg (new). Interrupted Fern (Osmunda claytoniana ), photographed in the Garden on June 9, 1953 by Martha Crone. 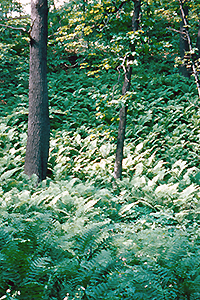 This hillside in the Woodland Garden is still covered with these ferns. Click on image for larger version. April 20 must have been the first reasonable day, as Martha planted 12 double snow trilliums (unusual plant) received from Mrs. E. H. Cummings in Preston, MN. The cold weather did cause the entire Spring season to be late as cold and rainy weeks followed in May also. The hummingbirds came back to the Garden on May 15. This was a date Martha always noted except in the late 1940s when her log is full of nothing but planting notes. During the Spring months Martha planted the following plants for the first time in the Garden. Many are not native. Azalea nudiflora, [Rhododendron periclymenoides (older R. nudiflorum] Pink Azalea not native, from Three Laurels. Trillium ozarkanum, [Trillium pusillum var. ozarkanum] Ozark Wakerobin, not native, from Ruth Mooney, Hi-mountain, MO. 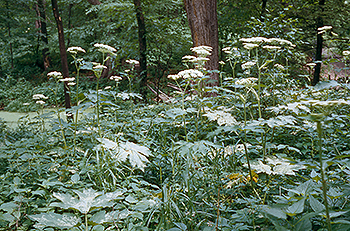 Cow Parsnip group near the wetland photographed on June 15, 1953 by Martha Crone. Click on image for a larger version. In the Summer Newsletter (Vol. 1 No. 3, July 1953), Martha Crone wrote about Snowball Bush, the Ruby Throated Hummingbird which returned to the Garden this year on May 15th, poison sumac, the Showy lady’s-slipper, ferns, the nighthawk, and the number of wild orchids found in Minnesota. On June 18, the Show Lady’s-slippers bloomed. This was the third latest date for bloom ever noted, matching the latest date that Ken Avery and Cary George recorded during their tenures; the second latest was June 21st in 1936 and June 28, 1945 is the latest date known. Mimulus moschatus, Musk flower, not native, from Meyers Nursery. A path into the Upland Garden, photographed by Martha Crone on July 16, 1953. Click on image for a larger version. In the Fall Newsletter (Vol. 1 No. 4, October 1953: ) Editor Martha Crone wrote about the Jerusalem Artichoke, Indian Pipe, Horsetail, Running Myrtle, Moneywort, Owls, Wild asters, edible wild fruits, and the blooming time of the Gentians. She noted the Friends now had 162 members. Once again, even though the Garden closed on Oct. 31 and she was only paid through that date, we find her still working in November. On Nov 12 she plants in the Garden Gentiana saponaria, Soapwort Gentian or Harvest bells, from seed, not native. Eloise Butler had planted it back in 1929. Her last entry is on Dec. 2nd where she plants seeds of Aquilegia coerulea, Colorado Blue Columbine and Blue Bellflower Campanulastrum americanum. Martha was fond of starting plants from seed in the fall and a number of the plants she reports setting out in the Garden in large quantities undoubtedly came from seedlings. (2). Annual Reports of the Garden Curator to the Board of Park Commissioners - dated Feb. 10, 1954 to Charles E. Doell. 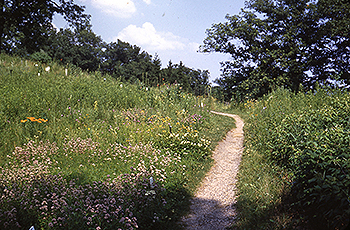 Photo top of page: A path into the Upland Garden, photographed by Martha Crone on July 16, 1953. Martha Crone's Annual Report to the Board of Park Commissioners dated Feb, 10, 1954 to Superintendent Charles E. Doell. Vol. 1, # 1, January 1953, Martha Crone, Editor. Vol. 1, # 2, April 1953, Martha Crone, Editor. Vol. 1, # 3, July 1953, Martha Crone, Editor. Vol. 1, # 4, October 1953, Martha Crone, Editor.